Midwestern Oil and Gas, a marginal field operator, has awarded forty-two scholarships to different categories of students in Delta State, in fulfillment of its Corporate Social Responsibility (CSR). The Managing Director of Suntrust Oil Company (JV partners with Midwestern Oil and Gas), Mrs Rachel Akhuetie, handing over the scholarship offer to one of the beneficiaries in the secondary school category, during the award ceremony in Kwale, Delta State. Similarly, the company also donated a modern block of five class rooms to the Ogbeani community, Kwale, in Delta State. Odita explained further that the CSR philosophy of the company is to consider it as a strategy that not only improves the lot of the people, but also providing a friendly environment that encourages productivity. The scholarship awardees which were selected from previously-organised written tests, include 13 students in the secondary school category and 29 undergraduates. The company had earlier advertised the offer wherein students were advised to apply. The awardees were each given their scholarship award letters during the ceremony. The awardees which were drawn from various universities and various fields of studies including medicine, Law, Engineering, Computer Science, Pharmacy, Laboratory Technology etc., will enjoy the scholarship offer throughout the duration of their study, provided they maintain a given academic standard of performance. While the secondary students will receive N50,000 each, every session, the undergraduates will receive N150,000 each for the 2017/2018 session. The Delta State Commissioner for Basic Education, Mr Chinedu Ebie, represented by the Chief Inspector of Education, Ndokwa West LGA, Mrs Patience Ngozi Okwuchi, commended Midwestern Oil and Gas for faithfulness in pursuing its CSR every year. He enjoined the beneficiaries of the awards to justify the support the company is giving them in their educational pursuits. He further charged the community to ensure that facilities provided for the development of the community, by the company, are well preserved and taken care of. The company which also hosted the community to an elaborate end-of-year celebration, donated a block of modern five classrooms, fitted with modern toilet facilities as well as borehole, in Lagos-Ogbe primary school, in Ogbeani community. The traditional ruler of the community, The Oduosa of Utagba-Ogbe Kingdom, HRM, Nze-Uku Isaac Obi, who commissioned the block of classrooms, commended the company for always filling the development gaps in the surrounding communities. He however tasked the company in the provision of furniture and other facilities in the school. Although Mrs Okwuchi expressed satisfaction that the gesture has rescued children from studying under the tree, the Chairman of Community Accredited Contact man Committee (CACC), Mr Emeke Ikuni, enjoined the management of the company to remember to provide the other needs of the community such as the provision of 500KVA transformer and Community bus. He however expressed satisfaction that the donation of the classrooms will transform the learning environment of the children, stressing that “the physical environment for learning affects the learner”. 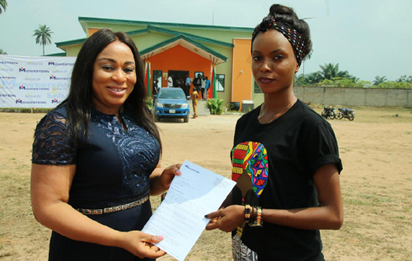 The post Midwestern Oil and Gas awards scholarship, donates classrooms in Delta appeared first on Vanguard News.